Punjab Daanish School Jaranwala District Faisalabad has announced 21 New Jobs in Daily Express Newspaper 24th March 2018. 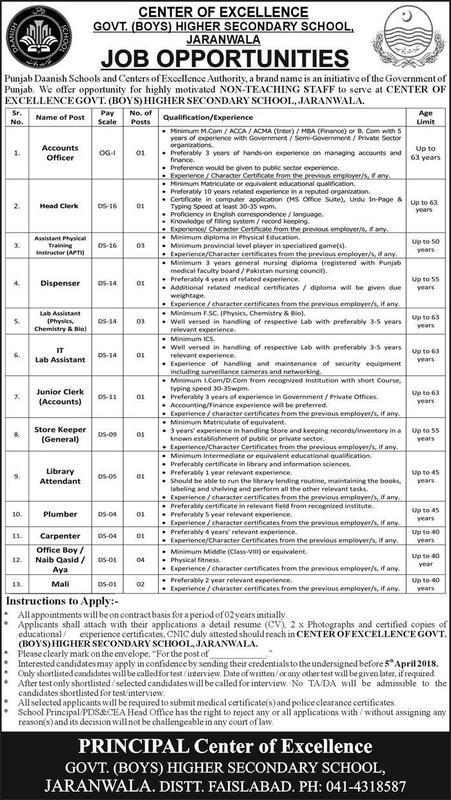 Applications are invited from Qualified, Energetic and Motivated personnel’s to Fill Vacant Jobs in Punjab Danish School 2018 against the Posts of Accounts Officer, Head Clerk, Assistant Physical Training Instructor, Dispenser, Lab Assistant, IT Lab Assistant, Junior Clerk, Store Keeper, Library Attendant, Plumber, Carpenter, Office Boy/Naib Qasid/Aya and Gardener. These all Appointments are for Center of Excellence Govt. Boys Higher Secondary School Jaranwala. All Appointments will be on Contract Basis initially for 02 Year.